Pope Francis, flanked by Alitalia CEO and chairman Luca Cordero di Montezemolo, second from right, and his daughter Guia, is greeted by an Italian Carabinieri paramilitary police officer, left, as he arrives to board his flight to Cuba, Sept. 19, 2015. Pope Francis has departed Rome for a 10-day trip to Cuba and the United States, the two bitter adversaries that recently ended decades of Cold War-era hostility under the pontiff's guidance. Cuban President Raul Castro will greet Francis when he arrives at Havana's Jose Marti International Airport Saturday afternoon. He will celebrate Mass in Havana's Revolutionary Square on Sunday before holding a private meeting with Castro. The Cuban leader has been so impressed with the Argentinean-born pope that he vowed earlier this year to return to the Roman Catholic Church, despite Cuba's official embrace of atheism. Francis will also travel to the cities of Hoguin and Santiago during his three-day visit to Cuba, with plans to hold Mass and meet with Catholic clergy in both cities before departing for Washington. Pope Francis and Vatican officials facilitated several months of secret talks between Havana and Washington in 2014 that ended with last December's historic announcements by Castro and U.S. President Barack Obama that the two countries had decided to re-establish diplomatic ties. They have since re-opened embassies in Washington and Havana. Relations began unraveling after Castro's brother Fidel overthrew President Fulgencio Batista on New Year's Day 1959 and established a communist dictatorship, taking over U.S. assets. The U.S. severed diplomatic ties with Havana two years later and imposed a total economic embargo in 1962. Pope Francis's trip to Cuba will be the third papal visit to the communist nation over the past two decades — John Paul the Second in 1998, and Pope Benedict in 2012. The United States and Russia are talking to each other about Syria to ensure their forces in the unstable conflict zone avoid accidentally engaging each other. 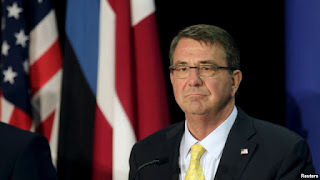 U.S. Defense Secretary Ash Carter spoke to his Russian counterpart Friday for the first time since Carter took office seven months ago. A senior Defense official said Russian Defense Minister Sergei Shoygu told Carter that Russia's activities in Syria are defensive in nature and that Moscow is just honoring commitments it made to the Syrian government. The diplomatic move Friday represents a new initiative in the Syrian crises as the U.S. and Russia have been content until now to denounce each other about their respective roles in the conflict. U.S. Secretary of State John Kerry, in London to talk with allies about options in Syria, said "We are looking for ways in which to try to find the common ground. Clearly, if you are going to have a political settlement, which we have always argued is the best and only way to resolve Syria, you need to have conversations with people and you need to find the common ground." The talks between the two world powers happened just hours after news of Russia's military build-up in Syria appeared to be entering a new phase with the arrival of fighter aircraft. Kerry will meet with some of his European counterparts Saturday to discuss the situation in Syria. U.S. officials said Friday that Russia had deployed four Sukoi attack aircraft to an air base near Latakia. Eight Russian helicopters have also been spotted. "Moscow’s ultimate intentions are unclear but initial signs suggest a focus on providing air support to Syrian forces and to humanitarian relief operations," a U.S. intelligence official told VOA on the condition of anonymity because he was not authorized to speak about the matter publicly. U.S. officials say Russia now has 500 naval infantrymen on the ground in Syria, with more on the way.